News and Announcements on Trip Planner products. 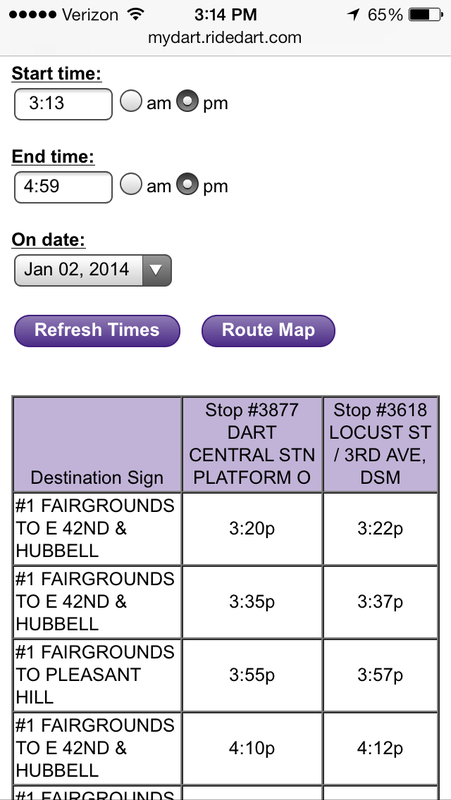 Posted on January 30, 2014 by Tony F.
Your smart phone can give you smarter DART route schedules. The MyDART Trip Planner BETA not only provides you all the bus schedules – you can customize them based on your travel patterns. You can access any route schedule for the day you choose, whether it be a weekday, Saturday, Sunday or special service day. 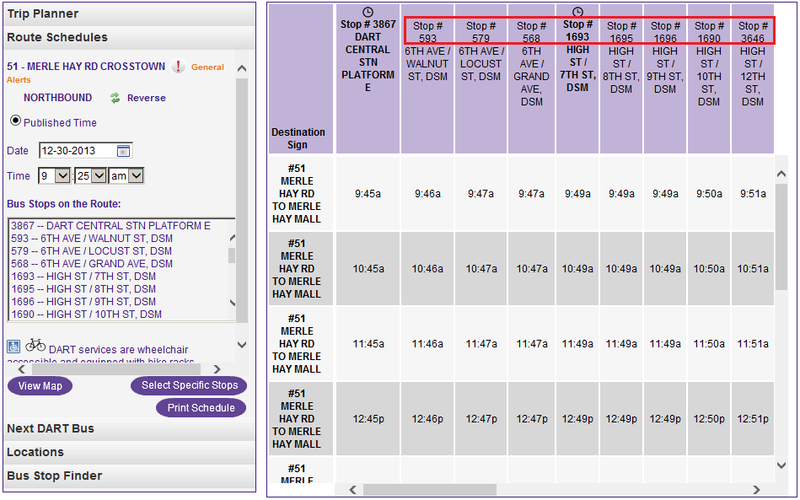 Customize the schedule to only show the bus stops you are interested in or narrow the time of day. 1) Go to mydart.ridedart.com in your browser. 2) On your smartphone device, click on the DART logo on the upper left corner to navigate to all the MyDART mobile features which includes Trip Planner, Route Schedules, Next DART Bus and Bus Stop Finder. 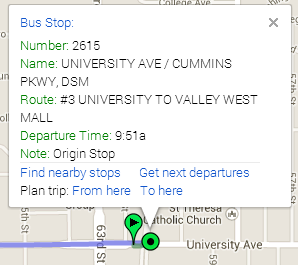 3) Click on the “Route Schedules” link to get to the page. 4) To use the Route Schedules feature, simply select the date you wish to travel and route you are want the schedule for. 5) Then hit the purple button at the bottom that says “View Route Schedule.” The date will automatically open with the current day so you can easily use it when you need it. You can adjust the date if you are looking for future trips. You have many options for viewing the schedule, including a certain span of time, the schedule between two bus stops, and maps of the route and desired bus stops. Click here for Google Android. More information about the MyDART Trip Planner, including a full user guide, is available on the DART Website. Click here to visit for more information. How do you keep track of bus schedules? Do you download the pdf schedules, use the DART website, use printed brochures and the MyDART Book, or do you use the mobile trip planner features? Let us know! 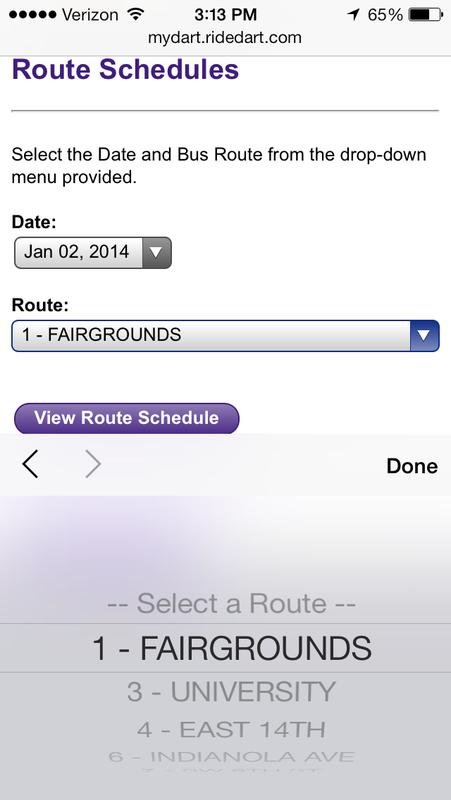 Posted on January 16, 2014 by Tony F.
Did you know the MyDART mobile site does more than just plan trips? One feature, Next DART Bus, lists the next scheduled bus arrivals at your bus stop. 1) Go to mydart.ridedart.com in your mobile browser. 2) Click on the DART logo on the upper left corner to navigate to all the MyDART mobile features which includes Trip Planner, Route Schedules, Next DART Bus, and Bus Stop Finder. 3) Click on the “Next DART Bus” link to get to the page. 4) To use the Next DART Bus feature, simply type in the Bus Stop ID and 5) hit the purple button at the bottom that says “Next DART Bus.” The time and date will automatically open with the current time so you can easily use it when you arrive at your stop. You can adjust the time if you are looking for future trips. Not sure what your bus stop ID is? The stop ID is posted underneath the DART Bus Stop sign and is a three- or four-digit number. Next DART Bus approximates the time the bus is scheduled to arrive based on its distance from the last timepoint. These are approximate times; actual arrival times may vary depending on traffic and weather. In the future, real-time bus arrival information will be available. Did you know there were other features than just the Trip Planner on the MyDART site? Have your tried Next DART Bus? Let us know! Posted on December 17, 2013 by Tony F.
The MyDART Trip Planner BETA now displays service alerts that are on your selected route, trip, or bus stop. This feature will notify you if a bus stop might be closed due to construction, if your route may be running a detour route during the weekend, or if there are other announcements that may affect your trip. MyDART Trip Planner BETA now shows service alerts that affect your trip. These announcements are developed for upcoming service alerts and may not reflect current conditions such as late buses and emergency detours. How Do You Plan Trips Online? Posted on December 16, 2013 by Tony F.
DART, this fall, introduced three ways to plan transit trips by computer or smartphone – MyDART Trip Planner, Google Maps and Bing Maps. 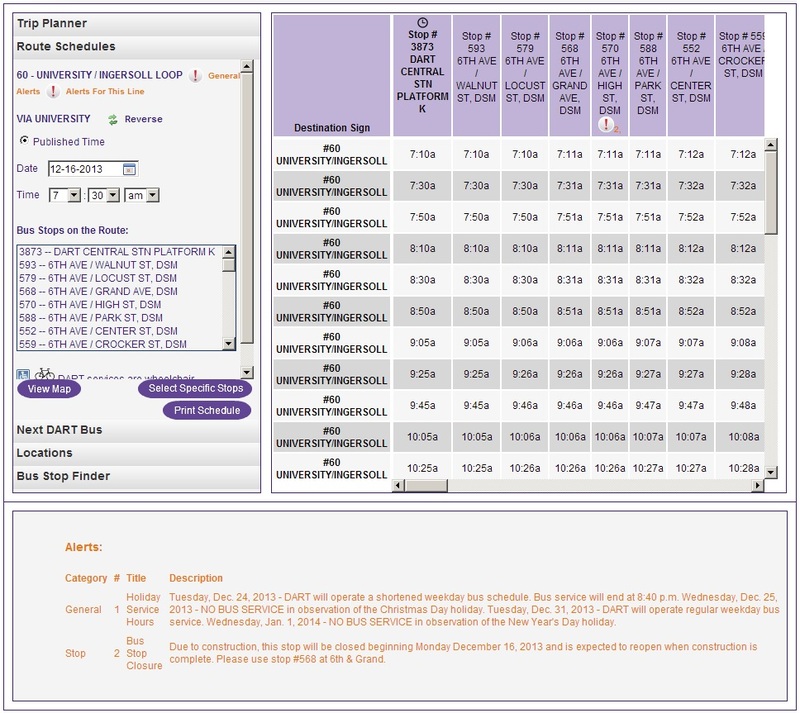 All tools utilize the same data, giving riders multiple ways to access DART schedule information. Have you had a chance to try out these Trip Planners? Which one do you use most?